So, your computer is running hot, but it’s mostly case heat. Or maybe dirty power is giving you bluescreens randomly (randomly meaning whenever you would lose the most work possible, and are reaching for the save button). Or maybe your power bill is just jaw-droppingly high, and you just built a new computer that idles most of the time, and shouldn’t be pulling nearly that much juice while you’re not in the latest GPU-stresstest of a game. 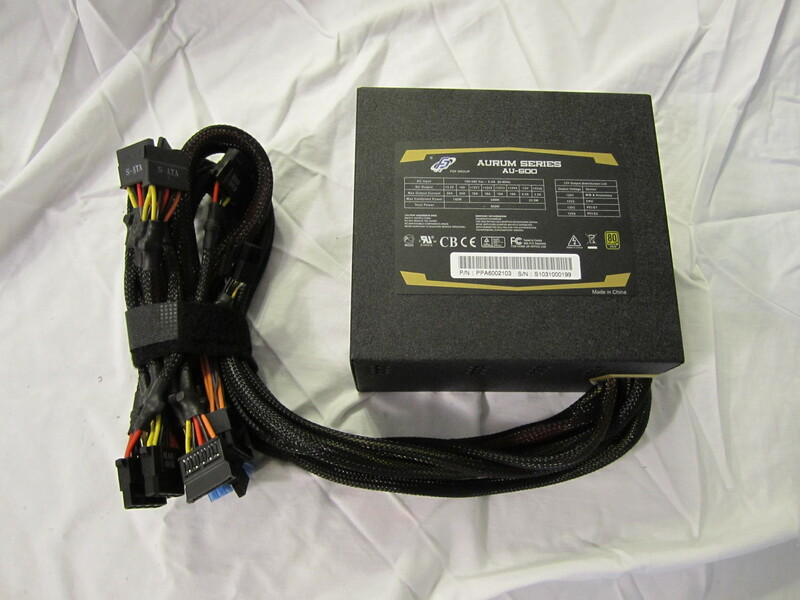 In each of these cases, there’s a good chance you could benefit from a new power supply. FSP’s Aurum line is stepping it up by delivering no less than 87% conversion efficiency – and in many cases, higher. Why is this interesting? Until recently, power supply efficiency was no big deal but with increasing energy prices and ecological concerns, even average people are taking note of what enterprise users had recently noticed – the operating cost of electronics is driven more and more by power consumption than initial purchase price. The industry’s response was to create the 80 Plus certification system, guaranteeing at a minimum that a power supply offers at least 80% efficiency at 20%, 50%, and 100% load, with a power factor of no less than 0.9 at full load. You don’t need to understand the science behind power factor to understand its implication on efficiency – at the specified power factor of .9, only 90% of the power pulled from the grid is used to do computing, the other 10% is wasted in the transmission before it ever comes time to take into account the efficiency of the power supply. The Aurum series actively compensates for fluctuating operational conditions and maintains a power factor of at least .99 – what does this mean? At the “typical efficiency” listed on its certification documents of a hair over 91%, (supplying 300 watts) the computer draws 329.6 watts from the grid, which sees a load of only 332.9 watts. This translates into cheaper power bills from the computer – and cheaper power bills because air conditioning is not having to remove eye-wateringly large amounts of waste heat. Even if your power supplies are supposedly efficient, if you have a low power factor, you will still be causing losses to someone – the power company. And according to Wikipedia, “Utilities typically charge additional costs to customers who have a power factor below some limit, which is typically 0.9 to 0.95”. Do it for the environment, do it for humanity’s future… or do it for your power bill. It makes sense any way you look at it. MIA IC (Multiple Intelligence Ability) Chipset: According to FSP, the control logic of their power supply monitors the current load, and using a technique called “Constant Hold up control” continuously adjusts its operation to achieve the best possible efficiency. PFC Double-circuited Over Voltage Protection: ensures maximum protection to the capacitors. Here at TWL, we’ve fried more than our fair share of hardware due to power problems. Anything that makes our gear more resilient, we welcome. Zero-Current Switch on PFC: ensures minimal energy wasted on switching. Low EMI and low ripple noise contribute to high efficiency. The best way to tell if your computer is electrically noisy is to plug some sensitive headphones into the front-panel audio ports and see how much bleeping, blooping, and hissing you can hear. Some of it will be the nearby front USB headers, some of it will be the power supply, and some of it will be the motherboard. It’s hard to tell which is which, but the test system with the Aurum connected produced no electrical noise on my best headphones, save for a quiet pop when power was turned on or off. Arrow Flow Technology for regulated outward airflow: “Arrow-shaped ventilation makes use of Aero Dynamics and Physical properties of hot air to improve and speed up hot air extraction.” The grille on the back of the power supply where it dumps used cooling air is, as one would expect from this, perforated with oddly arrow-shaped holes. We at the labs have no way of testing the fluid dynamics of hot air under such circumstances, but constructive use of turbulent flow to minimize air resistance and increase flow rate is within the realm of possibility. Hybrid Synergy 12V Rail Design: “Hybrid Synergy Design on 12v rails with max loads pledges compatibility to graphics cards and systems.” As best I can figure, this is a design feature that transfers more power to the video card connectors in order to keep the voltage within range when you’re pushing the power supply close to its limits, and voltage would normally drop, causing reboots and reliability issues. 105°C Japanese-made Capacitor: Components rated to withstand temperatures well in excess of the often hostile, hot environment within a power supply will withstand the comparatively tame innards of a typical PC nicely, and will tend to be especially slow to fail. Quiet and durable cooling: “Powered by low noise and long-lasting FDB fan.” My CPU cooler is exceedingly quiet. My case fans are not. The fans on the Aurum 600 contributed very little additional noise to the system’s operation. With case fans unplugged, the CPU fans set at minimum, and the system at idle, the operating noise fell below the cutoff on my sound level meter (Radio Shack cat. 33-2055) of 50 dB, with both A and C weighting in several positions no more than 3″ distant from the output fan. The case fans were enough to drive noise there to around 60 dB – in other words, this power supply contributed negligible noise to a system cooled with typical 120mm fans. Full Safety Approved: “Let OVP/UVP/OCP/SCP/OTP/OPP protect you and your system” If you’re going to the trouble of making such an awesome and reliable power supply, it’s probably worth proving that it won’t burn your customer’s house down. Someone’s had this power supply tested to make sure that won’t happen. S.B. Ready: “Support’s Intel’s latest platform” While the test rig was an AM3 based Phenom 2, it’s nice to know that I can stick with this power supply when I upgrade.